ALL “Pau” (finished in Hawaiian)! WHAT a year of classes! WARM thanks to Judy Jensen and her elves for coordinating the fine array of classes, instructors and students in these Members Teaching Members programs. See below for the full selection of classes. This class will teach various methods for making half square triangles, quarter square triangles, and flying geese. These three units are used in many quilt patterns, and students will be able to determine which technique they prefer. Awesome tote using a purchased pattern. Carolyn walks you through construction with ease. Learn to draft different designs using a compass. Why purchase a pattern–make your own! Download this free pattern and let Sharon show you how to make machine applique look like hand applique! Learn to sew beautiful binding by machine. Saves loads of time and look beautiful! Take your quilt from dull to dazzling with a chevron braided border. 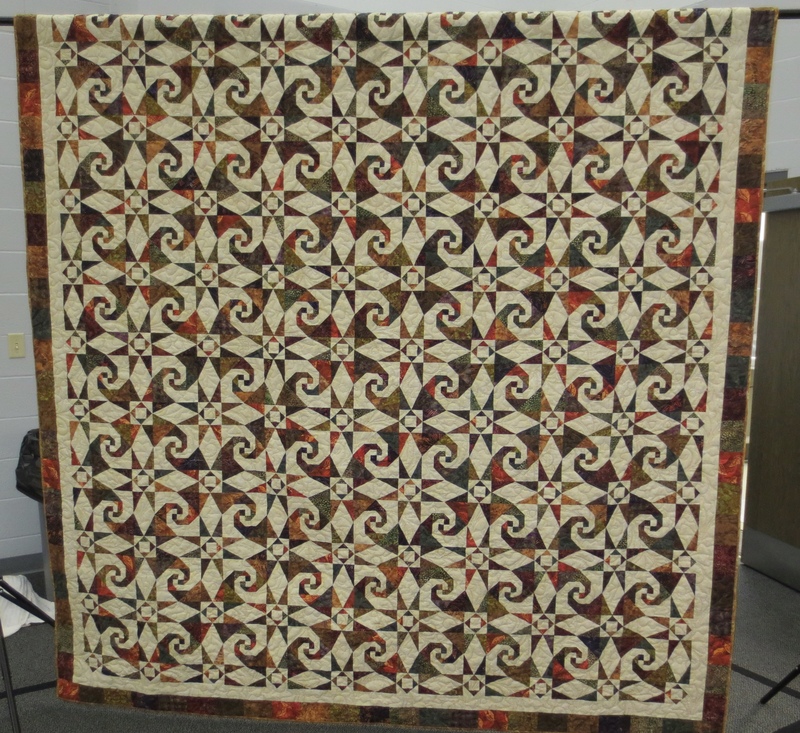 Learn ways to stabilize your quilt to prevent waves. The class you asked for after Bonnie’s great program last year. Add color and dimension to your quilts with crayons. Quilt 101 Vicki Kauth and Sharon Crozier, Instructors (Vicki shown below with class table runner project). Open to the community, these 3 classes (fee 25.00 for members; 30.00 for nonmembers)) help quilters with straight seams and quilt assembly. Click on link for more information. The best class tote ever! Hold your large cutting mat and all your gear! Learn all the tricks and Ginger’s secret’s to her blue ribbon minis! Quilt 102 Vicki Kauth and Sharon Crozier, Instructors (Vicki shown below with class table runner project). September 11 (Tuesday) 9 a.m.-3 p.m.
October 1 (Monday) 9 a.m.-3 p.m.